Cold rain showers or accumulated snow in the suburban highlands didn’t deter 40 volunteers from trekking to Carkeek Park on Saturday for a training session on identifying eggs laid by local amphibian species. Volunteers inspect possible egg masses underwater at Carkeek Park. Photo by Stan Milkowski. 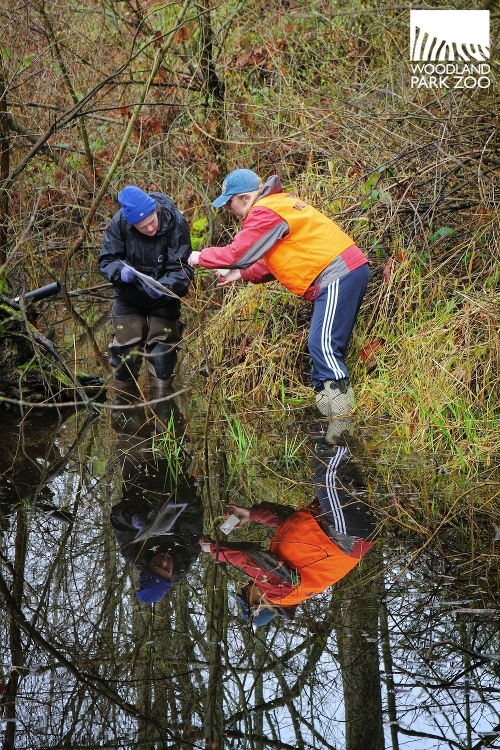 Outfitted in knee-high boots or hip waders, the volunteers carefully treaded in Carkeek’s ponds under the guidance of biologists and naturalists from Woodland Park Zoo, Washington Department of Fish and Wildlife and Seattle Parks and Recreation. The industrious scene was a practice session for a new amphibian program that teams ““citizen scientists” with Woodland Park Zoo, Washington Department of Fish and Wildlife, Point Defiance Zoo & Aquarium, and Northwest Trek Wildlife Park to survey amphibian egg masses in ponds and wetlands in western Washington. Hand-held GPS units, digital cameras, field identification guides and, for some, polarized sunglasses, were the tools of the day. The special sunglasses help reduce any blinding glare on the water’s surface. Citizen scientists take notes to mark their findings at Carkeek Park. Photo by Sarah Lovrien/Woodland Park Zoo. “I found one!” or “Ooh, this mass is the size of a bubble tea pearl” were heard among the volunteers wading knee-high in the ponds. One volunteer had an iPhone equipped with a waterproof case to allow underwater photos – a handy tool for the murky water of wetlands. Thanks to grant support from the NW Zoo & AquariumAlliance, the new regional program will help keep a watchful eye on eight amphibian species: western toad, Northwestern salamander, northern red-legged frog, Pacific tree frog, Oregon spotted frog, rough-skinned newt, American bullfrog and the long-toed salamander. The Alliance promotes collaboration on regional conservation among zoos and aquariums in the Pacific Northwest. Long-toed salamander egg mass. Photo by Stan Milkowski. 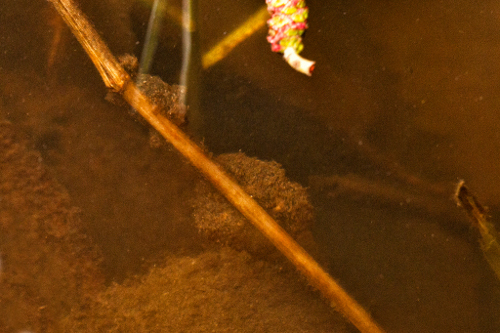 A few egg masses discovered during the training session were confirmed to be the long-toed salamander. According to WDFW, this is typically the first species to breed and lay eggs in Pacific Northwest wetlands. Unfortunately, due to the cold snap, the early-laid eggs will most likely not survive. Each of the volunteers has committed to surveying for amphibians at least once a month through August. Teams will be monitoring designated Seattle and Shoreline city parks and other wetland sites throughout western Washington. Amphibians around the world are under siege by a number of threats including the loss of habitat, climate change, infectious disease, pollution and pesticides. However, state biologists lack sufficient data on what’s happening to amphibians in our own backyard. 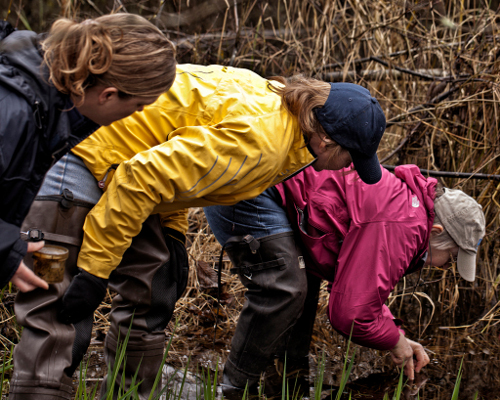 Documentation by citizen volunteers will help provide critical data on local populations, which over the long term can help determine if amphibian species in the region are declining or increasing, and why. 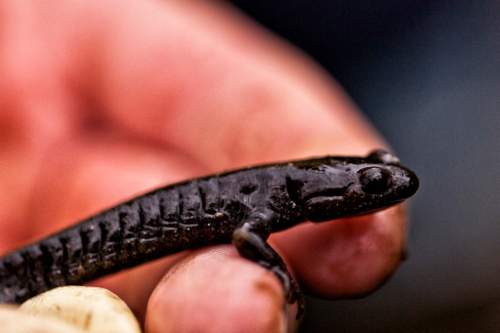 Long-toed salamander. Photo by Stan Milkowski. Volunteers use a guidebook to help in identification. Photo by Stan Milkowski. 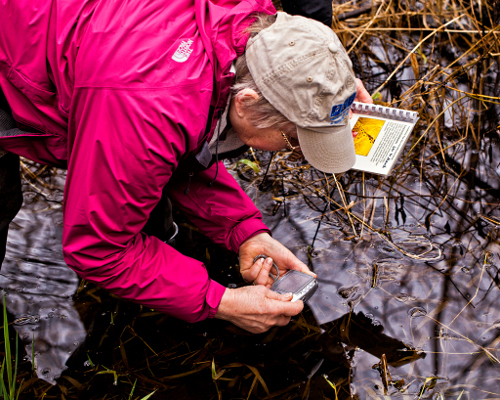 A waitlist has already begun for next year's class of citizen scientists in the Amphibian Monitoring Program, but you can join the list to stay tuned for details about the 2013 class. Until then, if you want to learn more about the amazing world of amphibians, join us for Leap Day: Amphibian Conservation on February 29 and March 3 at Woodland Park Zoo (full schedule at the links). We’ll celebrate amphibian conservation success stories through frog-themed crafts, keeper chats on frogs and amphibians, puppet shows and interactive activities. Hear from national experts, including our curator of herpetology, Dr. Jennifer Pramuk, about what is being done to save amphibians. Pacific Northwest Herpetological Society members also will be on hand to discuss frogs and other amphibians. On March 3, kids ages 3-12 dressed in green or other frog-themed gear will receive free zoo admission with a paid adult. From noon to 1:00 p.m, kids can meet Everett AquaSox mascot Webbly the tree frog!